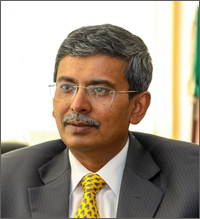 Mr. Prabhat Kumar assumed charge as Ambassador of India to Kazakhstan on 27.11.2017. Previous to this appointment, he served as India’s Ambassador to Colombia and Ecuador, from May 2014 to October 2017. He was in Charge of Energy Security Division of Ministry of External Affairs (MEA) from October 2010 to April 2014. This division served as the nodal point in the MEA for energy security related matters; Subsequently he also given the additional responsibility of heading the Investment & Technology Promotion (ITP) Division. The two divisions of the Ministry of External Affairs have now been combined and rechristened as the Economic Diplomacy division. From 2007 to 2010, he was posted in the Permanent Mission of India to the Conference of Disarmament in Geneva as Counsellor and Minister. The Conference on Disarmament is an Intergovernmental organization functioning under the auspices of the UN, which negotiates international disarmament and arms control treaties. Before going to Geneva, he was Counsellor and First Secretary in charge of the Political Wing in Embassy of India, Kathmandu from July 2003 to February 2007. At headquarters in Delhi from September 1999 to June 2003, he worked in the Finance and Protocol Divisions of Ministry of External Affairs. From 1996-99, he served as First Secretary and Charge d' Affaires in the Embassy in Zagreb, Croatia. In his first posting abroad in Madrid in 1993, he underwent compulsory language training in Spanish in the first year and was absorbed in the mission as Head of Chancery and in charge of political and commercial work. He joined the India Foreign Service in September 1991 and underwent training at Lal Bahadur Shastri National Administration Academy, Mussorie, and Foreign Service Institute, New Delhi during 1991-92. He did his Graduation (BA- History Honors) from Hansraj College, Delhi University (1984-87) and Post Graduation in History (1987-89) from Delhi University. He hails from Patna, Bihar and is fluent in Spanish apart from Bhojpuri, Hindi and English.